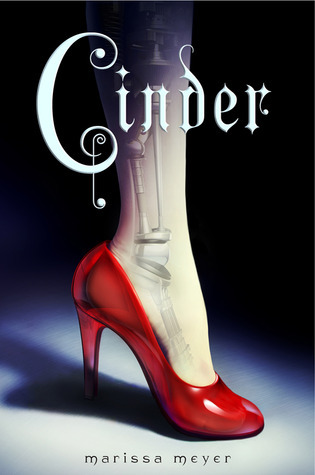 Review: Cinder by Marissa Meyer - Book.Blog.Bake. Forgive me, fellow book lovers, for I have judged a book before reading it. I took one look at the summary for Cinder and said something to the effect of “Cool. . . but not my thing.” Then this book started showing up everywhere in people’s favorite books of 2012 list, and my curiosity couldn’t be contained, so I grabbed it from a local bookstore when I saw it had been marked down to a mere $5, and I found that Cinder is indeed my kind of thing. There’s so much to like in this book. We have Cinder, the cyborg Cinderella who is a mechanic, has a good relationship with one of her stepsisters, and lives in New Beijing where there’s all sorts of intergalactic political tension and a deadly plague, and that’s only the beginning. Cinder is such a great character, fresh and unique, and Kai, the Prince in our tale, is the same way. In fact, I really like the character of Kai. In many Cinderella retellings, the Prince is little more than a plot device, but in Cinder he’s a real, living character who has decisions to make and stress on his shoulders and a million things on his mind. Every interaction between Cinder and Kai seems genuine and believable. I give props to Meyer for making a retelling of Cinderella fresh, because while in some ways it is a classical retelling, in others it’s extremely different. As I read, I thought I had a vague idea of where the plot was going, and I did, but instead of making me lose interest that little bit of plot I could follow just left me wanting to know exactly how everything happened. Even though the book is around 380 pages, I raced through it and read it all in one sitting. I couldn’t leave Cinder and her world when I didn’t know the ending of the book. The “twist” at the end of this book was pretty obvious early on, in my opinion, but it didn’t dilute the power of the book as much as I thought it would. This world is just so original, I’m left wanting more. I can’t wait to the sequel, Scarlet, releases in February. You can find Cinder on Amazon. Final Impression: I loved this book. It’s so unique, filled with characters that I think will soon become favorites, and left me wanting to know more of the world. I highly recommend it. 5/5 stars. I agree with basically everything you said! I really dislike the cover – I feel like it doesn’t accurately represent the book, even if it is pretty. The story, though, is very unique and I’m impressed with how Marissa Meyer has reinterpreted it and taken liberties in its creation. Top Ten Tuesday: Top Ten Settings I’d Like to See More Of(Or At All) | Book.Blog.Bake. The One Month Wrap-Up | Book.Blog.Bake. I haven’t read it, for the same reasons you thought you wouldn’t really like it, but I might have to change my mind! Glad you liked it! I’d definitely suggest giving it a try! It’s a really easy, fast-paced read, and even though the word “cyborg” would normally send me running in the other direction, it really makes sense in the story without taking over the focus. I know! Scarlet really cannot be released soon enough. I just finished this book a few days ago! “Cool. . . but not my thing.” was exactly how I first felt about Cinder, but when I picked it up, I ended up loving it so much! Very excited for Scarlet to come out next month; great review! Thanks for stopping by! I’m still so surprised I loved this book, and how eagerly I’m awaiting Scarlet. I’m so glad you loved this book! I know what you mean by guessing where it’s going, but you’re so invested in it and the characters are so real. You don’t just read it for the story, but for them as well. Awesome awesome awesome book! I’m on the edge of my seat, waiting for Scarlet next month! Exactly–despite the interesting plot, I feel this is almost more of a character-driven book, especially for Cinder. She’s just so sympathetic and likable! (And I am not a fan of the original Cinderella).